In this work, we describe protocols to investigate the role of extracellular vesicles (EVs) released by Plasmodium falciparum infected erythrocytes. In particular, we focus on the interactions of EVs with endothelial cells. Andrea Hernández-Castañeda, M., Mbagwu, S., Babatunde, K. A., Walch, M., Filgueira, L., Mantel, P. Y. Evaluation of Extracellular Vesicle Function During Malaria Infection. J. Vis. Exp. (132), e57067, doi:10.3791/57067 (2018). Malaria is a life-threatening disease caused by Plasmodium parasites, with P. falciparum being the most prevalent on the African continent and responsible for most malaria-related deaths globally. Several factors including parasite sequestration in tissues, vascular dysfunction, and inflammatory responses influence the evolution of the disease in malaria-infected people. P. falciparum-infected red blood cells (iRBCs) release small extracellular vesicles (EVs) containing different kinds of cargo molecules that mediate pathogenesis and cellular communication between parasites and host. EVs are efficiently taken up by cells in which they modulate their function. Here we discuss strategies to address the role of EVs in parasite-host interactions. First, we describe a straightforward method for labeling and tracking EV internalization by endothelial cells, using a green cell linker dye. Second, we report a simple way to measure permeability across an endothelial cell monolayer by using a fluorescently labeled dextran. Finally, we show how to investigate the role of small non-coding RNA molecules in endothelial cell function. According to the World Health Organization, there were 212 million new cases of malaria worldwide in 2015 and approximately 429,000 people died, mainly children under five years of age1. The mechanisms leading to severe disease, which is often associated with vascular dysfunction, remain ill-defined2. Plasmodium-iRBCs secrete small bi-lipid membrane spheres known as extracellular vesicles (EVs). It is known that these EVs are potentially relevant to the infection process and to the host immune response to infection; however, little is known about the exact function of these small vesicles during malaria infection3. It is possible that they play two important roles: on one hand, they might contribute to the pathogenesis by activating macrophages4,5; and on the other hand, they might mediate cellular communication between parasites and between parasites and host6,7. In fact, parasites can transfer proteins or nucleic acids between each other via EVs. For example, Trypanosoma brucei rhodesiense EVs can transfer virulence factor Serum Resistance-Associated (SRA), and can target both other T. brucei and host erythrocytes8. Furthermore, P. falciparum-iRBCs communicate between each other by transferring nucleic acids within EVs. This allows the parasites to optimize and synchronize its growth. In fact, EVs might be the major regulator of gametocyte conversion, and therefore contribute to the regulation of the transmission stage7. Not only do EVs regulate the parasites, they also mediate parasite-host interactions. We recently discovered that EVs from iRBCs contain host-derived microRNAs (miRNAs; small RNA species in the range of 21-25 nucleotides9) that were taken up by human endothelial cells. The miRNAs in the EVs form a stable complex with Ago2 (a member of the RNA-induced silencing complex), which once delivered to the recipient cells, is capable of specifically silencing gene expression and affecting the barrier properties of the cells10. Standard protocols have been developed to investigate the function of EVs. Here, we describe first a protocol that allows the fluorescent labeling of EVs to investigate their uptake by recipient cells. In addition, by using a confocal microscope, it is possible to track the EV's fate inside the cell. Several fluorescent dyes can be used to track EVs. The amine-reactive dye, 5-(and-6)-Carboxyfluorescein Diacetate Succinimidyl Ester (CFSE) and Calcein-AM become fluorescent once inside the vesicles. We prefer to use the amphiphilic label, PKH, because it gives a brighter and more uniform signal. This approach provides important information to understand the interactions between EVs and recipient cells. While in some cases EVs bind to the surface of the cells, some vesicles are rapidly taken up. Upon uptake, EVs deliver their cargoes to the cells, in which they exert their regulatory functions. Here, we describe a protocol to measure the barrier function of the endothelial cells in vitro by quantifying the transfer of a fluorescent dextran through a cellular monolayer. More sensitive tracers can be used such as radiolabeled markers. However, they require special safety precautions for use. Other assays exist to measure the in vitro barrier function such as transendothelial electrical resistance (TEER), which measures tight junction integrity. Finally visualizing ZO-1, a tight junction protein, by immunofluorescence allows assessment of tight junction integrity as well10. Since EVs are complex and heterogeneous entities containing several cargoes with potential regulatory characteristic, it is useful to overexpress a specific RNA to study its effect on the recipient cell. Therefore, we also define a protocol that aims to generate stable cell lines expressing the miRNA of interest10. Human RBCs were obtained from the blood of healthy donors, in accordance with the guidelines of Swissethics (swissethics.ch). NOTE: P. falciparum parasite cultures (3D7) and EV production were previously described in Mbagwu, et al.11 Because P. falciparum is a human pathogen, consult the local regulations for handling. The cultures should be kept sterile the entire time. Place 100 µg of EVs in 1 mL of PBS in a microcentrifuge tube. Centrifuge the EVs in a microcentrifuge tube at maximum speed (20,000 x g) for 7 min to pellet. NOTE: Since hemozoin is present in EVs, a red-dark brownish pellet should be observed. If the supernatant is reddish, then the EVs have lysed. After centrifugation, aspirate the supernatant carefully, in order to avoid removing any EVs. NOTE: Minimize the amount of remaining buffer present before resuspending EVs in diluent C in order to increase reproducibility and efficiency of the staining. Resuspend the EV pellet in 100 µL of diluent C (2X EV Suspension) and gently pipet to insure complete dispersion. Prepare a new microcentrifuge tube and add 4 µL of the PKH67 ethanolic dye solution to 100 µL of diluent C. Vortex well to mix. Prepare this 2x dye solution (40 µM) immediately prior to staining. NOTE: To avoid heterogeneous staining, do not add the PKH67 ethanolic dye solution directly to the EV pellet. Rapidly, combine the 100 µL of 2X EV Suspension (step 1.4) with the 100 µL of 2X dye solution (step 1.5). Then, mix the sample by pipetting up and down 10 times. Incubate the EV/Dye suspension from step 1.6 for 5 min protected from light and mix by vortexing 3-4 times during the 5 min incubation. NOTE: Incubating the EV/Dye suspension for longer times provides no advantage, because the staining is so rapid. Stop the staining reaction by adding an equal volume (200 µL) of serum and incubate for 1 min to allow binding of excess dye. NOTE: Before stopping the staining, deplete the serum from EVs by centrifugation at 20,000 x g for 20 min. Wash 3 times with PBS and spin down at 20,000 x g for 5 min. Resuspend the EVs in 100 µL of PBS to reach a final concentration of 1 µg/µL. NOTE: The following protocol describes the tracking of EV internalization by endothelial cells grown on glass coverslips. The endothelial cells are semi-immortalized human Bone Marrow Endothelial cells as described in12. Working in a sterile environment, coat coverslips with an excess of 0.01% poly-L-lysine for 10 min at room temperature (RT). Aspirate the poly-L-lysine solution and allow the coverslips to dry completely. Perform a viable endothelial cell count using Trypan blue exclusion and a hemocytometer. Transfer 1 x 105 endothelial cells in 1 mL of complete Endothelial Cell Growth Medium containing the Supplement Mix to the poly-L-lysine-coated coverslips and let the cells grow to a monolayer. NOTE: The medium contains growth factors that allow cells to form a monolayer and to form tight junctions. Once the cells form a monolayer, carefully aspirate the medium and add 1 mL of fresh medium to wash the cells. Repeat the wash once more. Add 50 µg of PKH67-labeled EVs and incubate for 4 h.
NOTE: To find the optimal time-point for uptake, a time-course can be performed. After 4 h, aspirate the medium, and wash the cells 3 times with PBS to remove excess and unbound EVs. Fix the cells with 3% paraformaldehyde solution in PBS for 15 min. NOTE: Methanol can disrupt actin during the fixation process; therefore, it is best to avoid any methanol containing fixatives or other solvent-based fixatives. It is recommended to use methanol-free formaldehyde as a fixative. Wash the cells 3 times with PBS. Add carefully 250 µL of 0.1% Triton X-100 in PBS to permeabilize the cells. Incubate at RT for 5 min. Wash 3 times with PBS. Add 400 µL of blocking buffer (5% BSA in PBS) for 30 min at RT to block non-specific binding. Wash the cells once with PBS. Prepare the staining solution by diluting 5 µL of the phalloidin stock solution in 200 µL PBS/1% BSA per each cover slip. Pipet 200 µL of the staining solution on the coverslip and incubate for 20 min at RT. Wash 3 times with PBS. Counterstain the DNA for 30 s with Hoechst 33342 at a final concentration of 2 µg/mL in 200 µL of PBS. Wash 2x the coverslip by adding 400 µL of PBS. Carefully grab the coverslip with forceps and invert it on the top of a drop of antifade mounting media on a glass slide. Remove gently the excess media with a tissue and seal each side with nail polish. Store the slides protected from the light at 4 °C. Visualize the cells using a confocal microscope at laser excitations 405, 488, and 543 nm and a 63X, 1.3 NA oil objective with fluorescent emissions at 450-470 nm (blue), 505-530 nm (green), and 620 nm. NOTE: Typical F-actin staining results are shown in Figure 1. NOTE: Endothelial cell permeability is assessed by measuring the transfer of rhodamine B isothiocyanate-dextran (average MW 70,000) across the endothelial cell monolayer. Dextran provides an excellent tool to study vascular permeability. Count viable endothelial cells using 0.4 % Trypan blue exclusion and a hemocytometer. Plate the endothelial cells at a density of 0.6 x 105 cells to confluence in 24-well tissue culture inserts (0.4 µm pore size) and leave undisturbed for at least 5 days to form differentiated monolayers. Refresh the medium every second day. Once the cells reach a monolayer, load the EVs (50 µg in 1 mL) on the upper chamber. Add the rhodamine-dextran to the top well at a final concentration of 20 mg/mL. Incubate the cells at 37 °C with 5% CO2. Monitor the transfer of the fluorescent dextran to the bottom well by measuring fluorescence emission from 40 µL medium aliquots. Set up the multi-label microplate reader at 544 nm excitation and 590 nm emission for measurements. NOTE: The amount of diffused dextran can be quantified using calibration curves established with the stock solution. In addition, kinetic experiments can be performed by removing small samples of the outer chamber medium during a time course (Figure 2). Even without any treatment, the dextran will diffuse through the cell monolayer. NOTE: Before transducing the cell lines with lentivirus, it is important to determine the kill curve of a selected drug for that particular cell line. To determine the minimum amount of drug concentration necessary to kill all of the cells, perform a dose response experiment using incremental doses of the selected drug. Because each mammalian cell line has a different sensitivity, before experimentation, the optimal concentration of the antibiotic should be determined by developing the kill curve titration as detailed below. Count the cells using the hemocytometer. Resuspend the endothelial cells at a concentration of 1 x 105 cells/mL in complete Endothelial Cell Growth Medium containing the Supplement Mix. Plate 1 x 104 cells into a 96-well plate in a final volume of 100 µL of the Endothelial Cell Growth Medium. Add 100 µL of medium containing the antibiotics to obtain a concentration of 0.1-10 µg/mL (see Figure 3). Examine the cell viability every 2 days under a light microscope using a 20X objective. Culture the cells for 10-14 days and replace the media containing puromycin every 2-3 days depending on cell growth. Add 10 µL/well MTS Reagent into each well, mix, and incubate for 4 h at 37 °C in standard culture conditions. Shake the plate briefly on a shaker and measure absorbance of treated and untreated cells using a plate reader at 490 nm (Figure 3). Plate 1 x 105 endothelial cells in 1 mL of complete medium the day before transduction. Perform transduction when the cells have reached 50-80% confluency. Thaw the lentivirus on ice, and make aliquots of the viral stocks to avoid freeze-thaw cycles. Spin down the material at 200 x g for 30 s, in tubes before opening to avoid spill over. Add hexadimethrine bromide to the cells at a final concentration of 8 µg/mL. NOTE: Hexadimethrine bromide helps the transduction efficiency, however in some cases it might be toxic for the cells. Therefore, the optimal concentration should be determined by performing a killing curve before the transduction. Swirl the plate gently to mix. Add the appropriate quantity of viral particles (between 0.5-2 x 106 particles) at a suitable multiplicity of infection (MOI) and swirl the plate gently for 30 s to mix. Centrifuge the cell-viral particle mix in the centrifuge at RT for 45 min at 300 x g to increase the transduction efficiency. Incubate the cell-viral particle mixture at 37 °C overnight. Remove carefully the viral particle-containing medium and discard appropriately. Replace it with fresh, pre-warmed complete culture medium. Start the selection with puromycin on the second day: remove the medium and replace it with fresh medium containing the correct concentration of puromycin as determined previously in section 4 (Figure 3). Harvest cells after puromycin selection and isolate RNA using an RNA isolating kit following the manufacturer's instructions. Perform cDNA synthesis with the selected miRNAs using a reverse transcription kit (see the Table of Materials). Set up the qPCR reaction according to the cited protocol13. Here, we describe protocols to investigate the interactions of EVs with host cells. The uptake of fluorescently labeled EVs is monitored by confocal microscopy (Figure 1). Endothelial cells efficiently take up EVs, however the incubation time with EVs can be optimized to track the uptake. 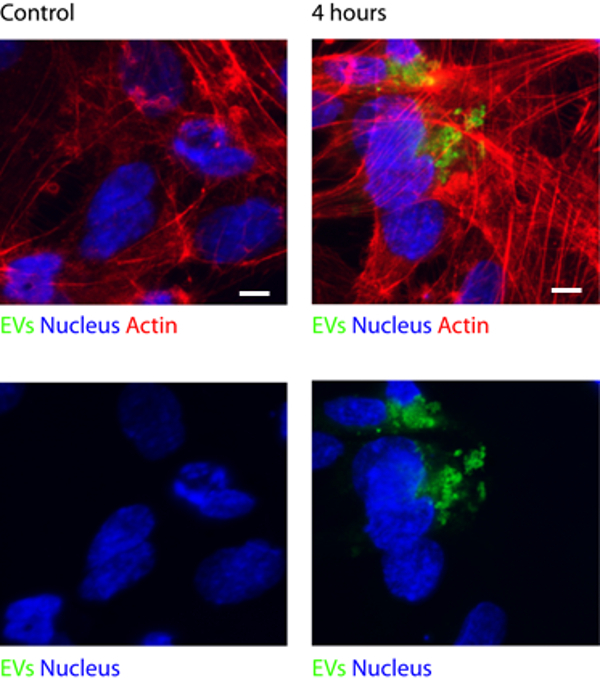 For a better localization of EVs inside the cells, stain actin with phalloidin. Next, we use a filter membrane on top of which a monolayer of endothelial cells grows. Rhodamine B isothiocyanate-dextran is applied on the top chamber of the filter membrane and then the permeability of the endothelial monolayer is measured by monitoring the transfer of the fluorescent dextran into the bottom chamber (Figure 2A). Typically, the permeability of the endothelial cells is affected upon incubation with an increasing amount of EVs (Figure 2B). It is important to grow the cells for several days to make sure they will form a monolayer, otherwise the dye will quickly diffuse through the wells. It is important to note that even without treatment, the dextran will diffuse slowly through the cell monolayer. MicroRNAs are key components of EVs and after transfer to the recipient cells, they regulate gene expression. In order to investigate specifically the role of miRNAs, it is very useful to overexpress them in the recipient cell line. Here we describe how to transduce miRNAs into endothelial cells. The first step consists of determining the concentration of puromycin that kills endothelial cells in order to select stably transduced cells (Figure 4A). Finally, the level of expression of the miRNAs can be controlled and validated by qPCR (Figure 4B). Figure 1: EVs are taken up by endothelial cells. Purified EVs were labeled in green with PKH67, and incubated for 4 h with a monolayer of endothelial cells. Untreated endothelial cells are used as a negative control. After extensive washing to remove unbound EVs, the cells were stained with phalloidin to stain actin (red) and Hoechst 33342 to stain the nucleus (blue). The cells were observed by confocal microscopy. Images were taken using a laser confocal microscope and a 63x 1.3 NA oil objective. Hoechst 33342 is excited at 405 nm and with emissions collected at 450-470 nm (blue); PKH67 is excited at 488 nm, emissions collected at 505-530 nm (green); and Phalloidin-594 is excited at 543 nm, emissions collected at 620 nm. Please click here to view a larger version of this figure. Figure 2: Effect of EV uptake on endothelial barrier. (A) Schematic of the diffusion of rhodamine-labeled dextran: endothelial cells are grown to confluence on the top of a filter membrane, the fluorescent dextran is applied to the top chamber and diffuses over time through the membrane. The effect of EVs on permeability is assessed after the addition of EVs to the top chamber by measuring the rate of diffusion of the dextran to the bottom chamber. (B) An increasing amount of EVs are incubated with endothelial cells. The transfer of rhodamine-labeled dextran across a trans-well membrane over time allows for permeability measurements. Permeability across the endothelial layer is significantly increased after 2 h of incubation with 50 and 100 µg/mL of EVs. Data represent mean (± s.e.m.) from 3 experiments. Please click here to view a larger version of this figure. Figure 3: Titration of puromycin. The stock solution of puromycin (10 mg/mL) is diluted in RPMI 1640 supplemented with 10% heat-inactivated (56 °C, 30 min) fetal calf serum, 2 mM glutamine, 1 mM sodium pyruvate, 100 U/mL penicillin/streptomycin. A total of 15 µL is added to 10 mL of medium in tube A. Then 7.5 mL of the solution from tube A is mixed to 2.5 mL of RPMI to tube B. Finally, 100 µL of the dilution are added to 100 µL of cells to give a final concentration of 7.5 µL/mL, 5.62 µL/mL and so on. Please click here to view a larger version of this figure. Figure 4: Generation of endothelial cells overexpressing miR451a. 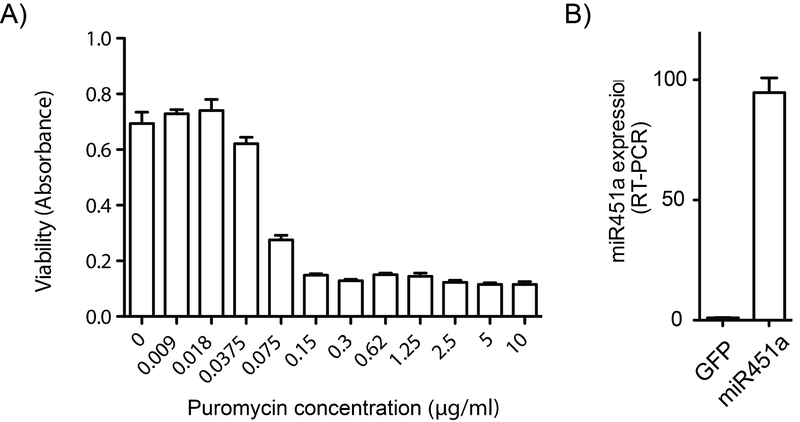 (A) Determination of the killing curve of puromycin on endothelial cells. Endothelial cells were incubated with puromycin at increasing doses. The viability was measured by MTS assay after 72 h. The data represent the mean (± s.e.m.) of one representative experiment. (B) RNAs derived from endothelial cells overexpressing miR451a or a negative control were harvested and the miR451a transcript was quantified by Real-Time PCR. qPCR results are normalized by the 2-Ct method using U6 as a housekeeper gene and expressed as mean (± s.e.m.) (n = 3 experiments). Please click here to view a larger version of this figure. Several parasites, including Toxoplasma, Trypanosoma, Leishmania, and Trichomonas trigger the release of EVs by the infected host cell. Depending on the pathogens, the released EVs can modulate the host immune response or mediate cellular communication between the parasites6. Yet, there is little evidence suggesting how these small vesicles contribute to malaria disease. Here, we have described several ways to investigate the function of EVs during Plasmodium infection. For instance, the uptake of EVs by recipient cells in vivo can be efficiently monitored by labeling them with the PKH67 fluorescent dye. Several controls have to be performed in order to guarantee the specificity of the labeling. It is important to note that once mixed with the diluent C, the PKH67 dye tends to form aggregates, and it is therefore necessary to include a control with the dye alone without EVs to determine the non-specific staining. Confocal microscopy is the method of choice to differentiate between vesicles bound to the surface and truly internalized by the recipient cells. In addition, it provides an excellent tool to track and monitor the number of vesicles taken up by the cells. However, it remains unclear how EVs are processed in the recipient cells14; therefore, performing a time-course using time-points of 2, 4, and 8 h, may be very useful in order to determine the optimal conditions for uptake. The addition of subcellular compartment markers can be used to track the EVs inside the cells by confocal microscopy. EV uptake has been shown to occur via membrane fusion or endocytosis15. The fusion can be monitored by labeling EVs with octadecyl rhodamine B (R18). The fusion of EVs with the cellular membranes results in the dilution of R18, which leads to an increase in fluorescence16. Uptake of EVs by endocytosis can be studied by using specific inhibitors of actin, microtubule, and dynamin10. Infected RBCs are cytoadherent to the microvasculature of the brain, in a process thought to be responsible to cause cerebral malaria17. Therefore, the transfer of parasite material via EVs is likely to influence endothelial cells and hence vascular function18. The in vitro assay described here, provides an easy way to investigate some of the basic properties of endothelial cells, as for example its permeability19. Additional test such as TEER or immunostaining with ZO-1 can provide more information about the tight junction integrity10. Furthermore, the in vitro model turns out to be a powerful tool to study the molecular mechanisms behind the cellular communication between parasites and host cells. Besides uptake, this setup allows the investigation of molecular mechanisms involved in this process. For example, we have monitored the transfer of miR451a to the acceptor cells by Real-Time PCR and fluorescent in situ hybridization. Additionally, we describe how to generate cell lines overexpressing a particular miRNA, to directly address the role of these small RNA in vascular function10. However, several controls should be performed including testing non-transduced cells, since the transduction itself might affect the cellular function. Furthermore, miRNA inhibitors can be used to neutralize the effect of the miRNAs. This study was financially supported in part by the Novartis foundation for medical- and biological research (to PYM), the Gottfried and Julia Bangerter-Rhyner-Stiftung (to MW and PYM), and the research pool of the University of Fribourg (to PYM). Additional grants include the Swiss Government Excellence Scholarships for Foreign Scholars (to KAB and SM). We thank Isabelle Fellay and Solange Kharoubi Hess for technical support. WHO. WHO Malaria Report 2015. (2015). Miller, L. H., Baruch, D. I., Marsh, K., Doumbo, O. K. The pathogenic basis of malaria. Nature. 415, (6872), 673-679 (2002). Mantel, P. Y., Marti, M. The role of extracellular vesicles in Plasmodium and other protozoan parasites. Cell Microbiol. 16, (3), 344-354 (2014). Couper, K. N., et al. Parasite-derived plasma microparticles contribute significantly to malaria infection-induced inflammation through potent macrophage stimulation. PLoS Pathog. 6, (1), e1000744 (2010). Schofield, L., Grau, G. E. Immunological processes in malaria pathogenesis. Nat Rev Immunol. 5, (9), 722-735 (2005). Mantel, P. Y., et al. Malaria-infected erythrocyte-derived microvesicles mediate cellular communication within the parasite population and with the host immune system. Cell Host Microbe. 13, (5), 521-534 (2013). Regev-Rudzki, N., et al. Cell-cell communication between malaria-infected red blood cells via exosome-like vesicles. Cell. 153, (5), 1120-1133 (2013). Szempruch, A. J., et al. Extracellular Vesicles from Trypanosoma brucei Mediate Virulence Factor Transfer and Cause Host Anemia. Cell. 164, (1-2), 246-257 (2016). Bartel, D. P. MicroRNAs: genomics, biogenesis, mechanism, and function. Cell. 116, (2), 281-297 (2004). Mantel, P. Y., et al. Infected erythrocyte-derived extracellular vesicles alter vascular function via regulatory Ago2-miRNA complexes in malaria. Nat Commun. 7, 12727 (2016). Mbagwu, S., Walch, M., Filgueira, L., Mantel, P. Y. Production and Characterization of Extracellular Vesicles in Malaria. Methods Mol Biol. 1660, 377-388 (2017). Schweitzer, K. M., et al. Characterization of a newly established human bone marrow endothelial cell line: distinct adhesive properties for hematopoietic progenitors compared with human umbilical vein endothelial cells. Lab Invest. 76, (1), 25-36 (1997). Wong, W., Farr, R., Joglekar, M., Januszewski, A., Hardikar, A. Probe-based Real-time PCR Approaches for Quantitative Measurement of microRNAs. J Vis Exp. (98), (2015). Mulcahy, L. A., Pink, R. C., Carter, D. R. Routes and mechanisms of extracellular vesicle uptake. J Extracell Vesicles. 3, (2014). French, K. C., Antonyak, M. A., Cerione, R. A. Extracellular vesicle docking at the cellular port: Extracellular vesicle binding and uptake. Semin Cell Dev Biol. 67, 48-55 (2017). Montecalvo, A., et al. Mechanism of transfer of functional microRNAs between mouse dendritic cells via exosomes. Blood. 119, (3), 756-766 (2012). Idro, R., Jenkins, N. E., Newton, C. R. Pathogenesis, clinical features, and neurological outcome of cerebral malaria. Lancet Neurol. 4, (12), 827-840 (2005). Jambou, R., et al. Plasmodium falciparum adhesion on human brain microvascular endothelial cells involves transmigration-like cup formation and induces opening of intercellular junctions. PLoS Pathog. 6, (7), e1001021 (2010). Zhou, W., et al. Cancer-secreted miR-105 destroys vascular endothelial barriers to promote metastasis. Cancer Cell. 25, (4), 501-515 (2014).